One of the brands on my current writing roster is Flat 54 – a UK-based website dedicated to design and decor for small spaces. Having lived in London for several years before moving to New York City, I’m more than familiar with turning a small flat into a home; so I absolutely love this website and the chic products the owner, Dawn, recommends. 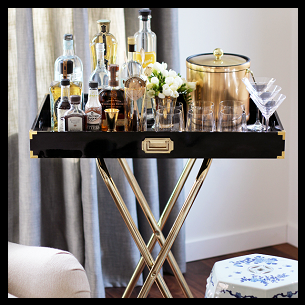 A recent blog post I wrote for Flat 54 involves one of my favorite features in any home – the mini bar. I gained so much inspiration just from browsing through the various bar carts, barware, and adorable glasses available, that I’m almost tempted to create a cocktail station in my own bedroom. That’d be pretty baller. Anyways, CLICK HERE to read my article about how to stock the perfect mini bar.